At a recent gymnastics conference we attended to introduce ClassJuggler to potential new customers, we got to hear from newly signing customers on what made us “stand out” for them among competing products in the field of gymnastics school management software. One theme that drew them: RESPONSIVENESS. Nearly half of the new customers signing up were switching from other providers, which is interesting. It’s one thing to acquire a new cheer or gymnastics studio customer who is switching from pen-and-paper bookkeeping and management – a slam-dunk to demonstrate the benefits. But it’s a whole different thing to get new customers who were already using a different gymnastics/cheerleading software product. We often hear from new customers what we heard at this event – that school owners have too little time in the day to deal with an unresponsive service provider. And our reputation for customer service and quick response times apparently preceded our arrival at the conference. This reputation, along with our in-person product demonstrations, prompted them to switch to ClassJuggler. We are grateful! 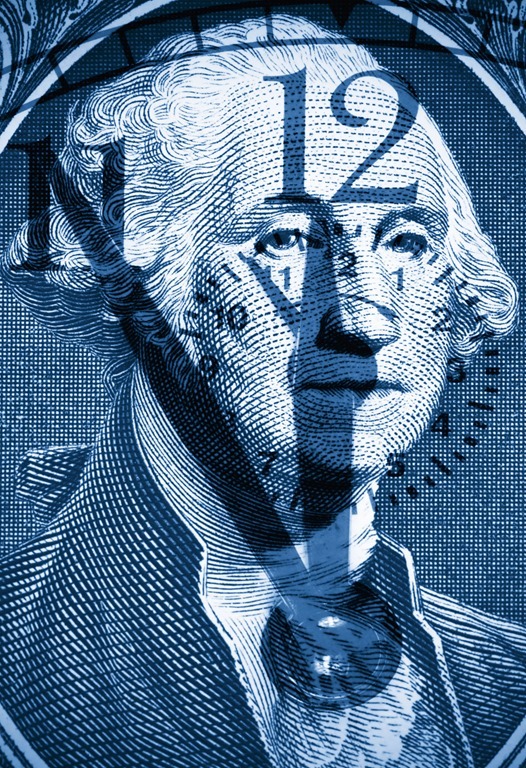 – and we work hard daily to maintain that reputation. See our outstanding customer ratings at Capterra. Check out the words of our customers responding to a third-party survey. 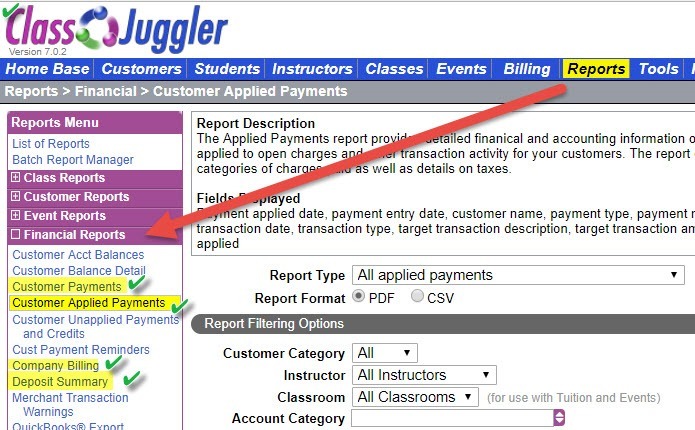 See more survey results showing that ClassJuggler meets the needs of school owners far better than any other online software for schools. Read words of praise for ClassJuggler from school owners experiencing huge increases in productivity, organization, and customer access. See more positive customer testimonials and case studies. These are just some of the reasons that Cheer ClassJuggler for gymnastics schools and cheer camps is growing and growing. 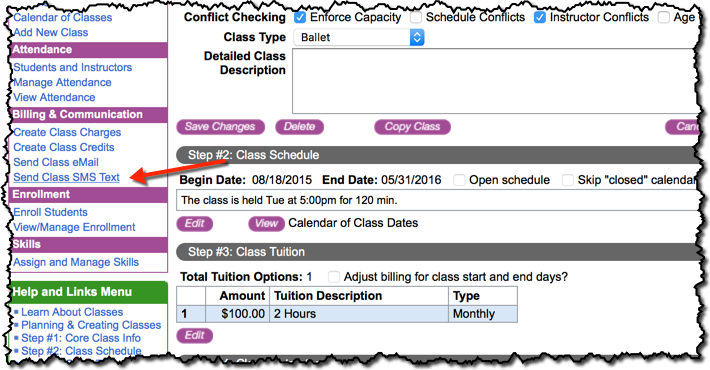 This entry was posted in Cheer ClassJuggler, Customer Support, Kudos from Customers and tagged gymnastics studio software, school software on August 4, 2016 by classjuggler. Maybe you didn’t even know that ClassJuggler’s e-mail features allow for this, but yes: adding a picture to your email template is simple. Here’s how. Make sure that web image is NOT password protected. Get the image’s internet address (also known as its URL), which you’ll use in email templates to “point” to the picture. In other words, you don’t actually copy it physically into the email template. Its the same method Constant Contact and MailChimp uses. You can easily get the address of most images from Web pages by right-clicking on them. There, you’ll enter the image’s web address. That’s it! For example, to use the ClassJuggler logo from our website into a template, you’d use this address: https://www.classjuggler.com/cj/pub/images/headerLogo1.png. Paste that into the Image editor dialog box, and suddenly our logo shows up in the template. Use the same process to add your company logo, Facebook button, pictures of your students or anything else you can imagine. If you need more help after following these steps, contact us! This entry was posted in Cheer ClassJuggler, ClassJuggler Dance, ClassJuggler Dojo, ClassJuggler Fitness, ClassJuggler for Franchises, ClassJuggler K-12, Customer Support, Music ClassJuggler, Swim ClassJuggler and tagged customer support on February 22, 2016 by classjuggler. Forget your ClassJuggler password? No problem! The good news is that forgotten passwords, and general password help is a common support question, common enough that ClassJuggler was built to make it easy for you to fix. In fact, recent customer service survey revealed that about one of every four survey respondents forgot at least 1 password daily! This resets your password, and e-mails you a new temporary password at the email address associated with the ID. You’ll need to change the temporary password immediately upon sign-in. 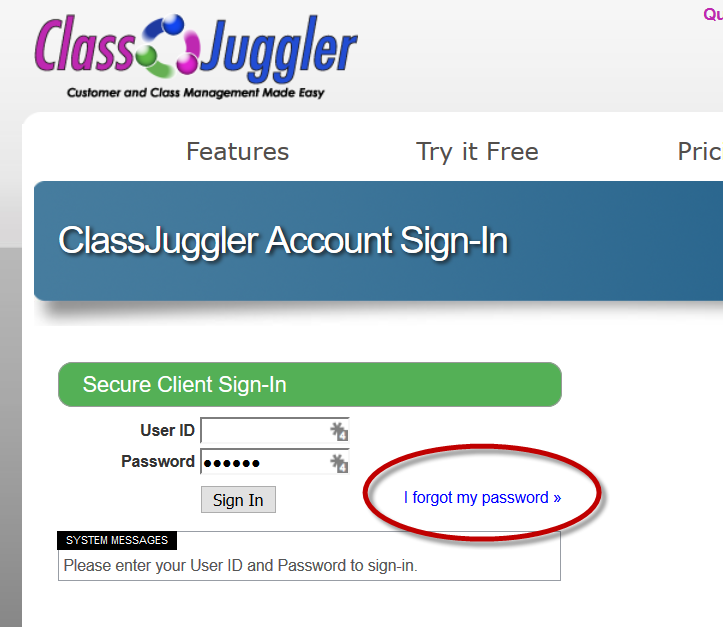 Important: the ClassJuggler support staff cannot see your password for security purposes, We can only guide you to reset your password. This entry was posted in Cheer ClassJuggler, ClassJuggler Dance, ClassJuggler Dojo, ClassJuggler Fitness, ClassJuggler for Franchises, ClassJuggler K-12, Customer Support, Music ClassJuggler, Swim ClassJuggler on February 16, 2016 by classjuggler. LAST CALL — Not too late to sign up for, and attend online, today’s 1pm Eastern (10am Pacific) webinar “Advanced Email Templates” on how to get the most from the ClassJuggler e-mail templates feature. To attend, email education@classjuggler.com and we’ll reserve your spot! This entry was posted in Cheer ClassJuggler, ClassJuggler Dance, ClassJuggler Dojo, ClassJuggler Fitness, ClassJuggler for Franchises, ClassJuggler K-12, Customer Support, Music ClassJuggler, Swim ClassJuggler and tagged class management software on February 9, 2016 by classjuggler. Have you tried ClassJuggler’s built-in texting tool? This highly customizable tool makes it easy to get timely messages to all or a subset of your customers. And here’s some extra good news; while some of our competitors charge per message for their clients to use their messaging tool, the ClassJuggler messaging tool is totally free to any client, no matter how many students you have! This happens when the competitor is using a 3rd party to provide the text service, which adds not only cost but the complexity of having two vendors to deal with, rather than the convenience of working with a class-based business software provider like ClassJuggler. 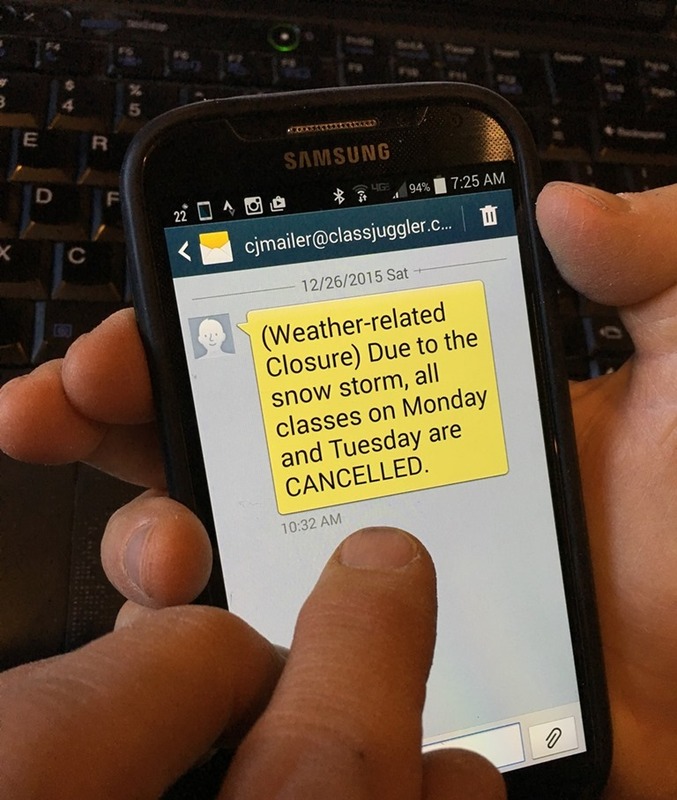 Text messaging is especially useful to you as a school owner or manager when you need to get a special, time-sensitive message to your customers or students. While many of your customers won’t check their e-mail regularly, it’s hard for them to miss an incoming text message to their smart phone. Don’t you hate getting a text message that doesn’t apply to you? That’s why your customers will appreciate the fact that you can filter your text message recipient list by certain attributes so that it only goes to the right audience for the communication. ClassJuggler’s text messaging tool allows you to pinpoint your audience, which makes your messages more likely to be appreciated. 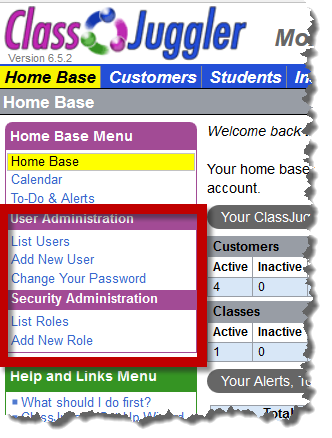 This let’s you or your admin target only those parent of classes affected on a particular day. Take the next SMS Messaging webinar when one is scheduled. 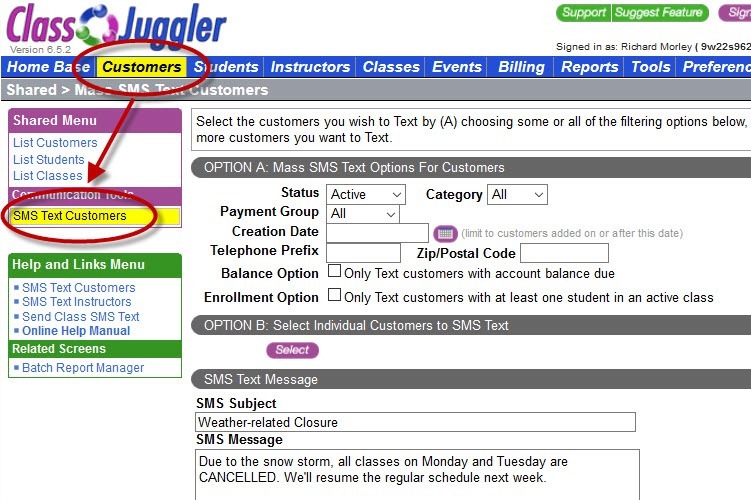 Use our robust ClassJuggler Help to learn about SMS Messaging. This entry was posted in About ClassJuggler, Cheer ClassJuggler, ClassJuggler Dance, ClassJuggler Dojo, ClassJuggler Fitness, ClassJuggler for Franchises, ClassJuggler K-12, Customer Support, Music ClassJuggler, Swim ClassJuggler and tagged business software for schools on December 28, 2015 by classjuggler.